Monday rain totals set a record for most rain on Aug. 20, but fell short of the one-day record. 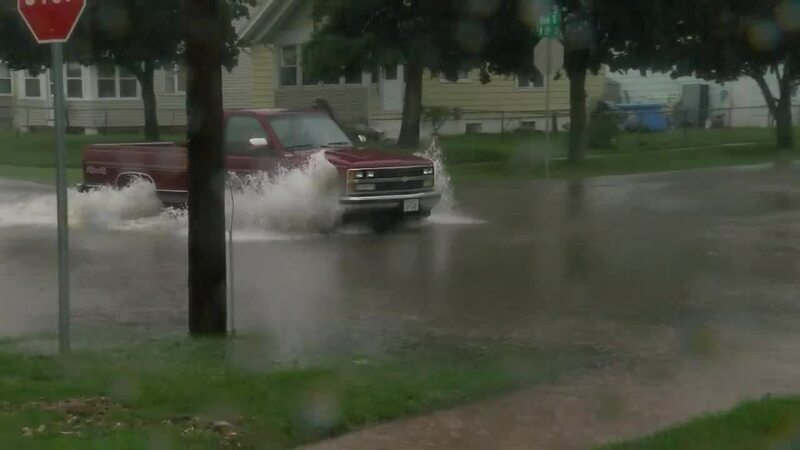 Storms throughout the day Monday brought high winds and record rainfall to the Omaha-metro area, resulting in flash flooding, power outages, and traffic issues. About 500 people were still without power Monday evening. As of 12:52 p.m., National Weather Service Omaha had reported more than 5 inches of rain had fallen at Eppley Airfield on Monday. As the storms diminished in the afternoon, not all floodwaters had receded; several intersections around the Omaha-metro remained closed. At 1:30 p.m., NP Dodge Park announced it was closing due to the Missouri River's rising water levels, and that fallen trees and debris had caused parts of Hummel Park to be closed as well. Pottawattamie County residents and business owners were asked to report flood damages to the Emergency Management Agency online , and were encouraged to pick up a "muck-out" cleaning kit from the Red Cross at the agency, located near Fifth Avenue and Sixth Street, from 10 a.m. to 4 p.m. Thursday. The heavy rainfall in eastern Nebraska and western Iowa also caused the U.S. Army Corps of Engineers to reduce flow at Gavins Point Dam on the Missouri River from 58,000 cubic feet per second to 52,000 cfs. Rainfall and runoff spiked the west Nishnabotna and Missouri rivers in the county, but neither were expected to reach flood stage. By 4 p.m., high water levels caused the Papio-Missouri River Natural Resources District to close all Elkhorn River access sites. Early morning storms brought high winds, flash floods and power outages — affecting households and stoplights — across the Omaha-metro area Monday morning. 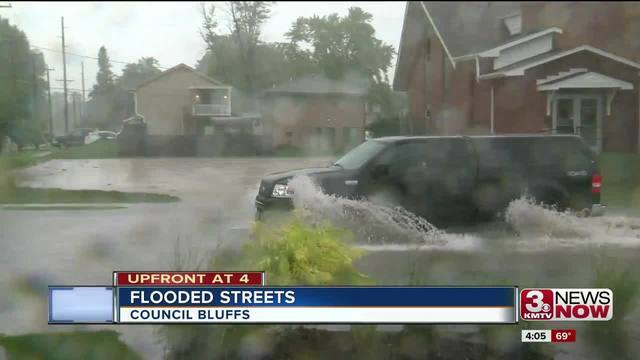 Omaha, Bellevue and Council Bluffs authorities were reporting flooded roadways and debris throughout the day. Streets in the west end are flooding due to the 4+ inches of rain we have received in the last 24 hours. All crews are out monitoring and checking inlets and closing some intersections. Please take caution and DO NOT attempt to drive through flooded streets. Crashes impacted travel on Interstate 80 . 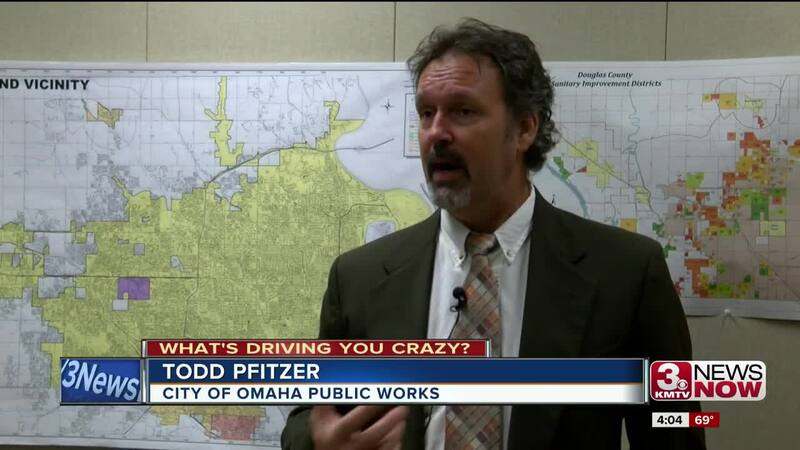 At 9 a.m., OPD had alerted drivers to exchange information for non-injury accidents . Just before 1 p.m., a jackknifed semi-truck had all eastbound Interstate 80 lanes blocked near Giles Road. Downed trees and winds caused power outages for more than 16,000 Omaha Public Power District customers, the district reported at about 8 a.m. About 45 min later, OPPD was reporting they had restored power to more than 3,000 of those customers. By 10 a.m., 9,833 were still without power — but power had been restored to North High School. At 11:30 a.m., OPPD was reporting about 5,400 customers were still without power. By 1 p.m., that number of customers without power had dropped to about 1,000. Mid-America Energy Co. also reported outages Monday morning in Council Bluffs; nearly 300 were still without power as of 1:20 p.m.
Outages affected major intersections, like 90th Street and West Dodge Road, during the morning commute. #TrafficNow -Dodge is a parking lot this morning. "There's a lot of activity at our metro centers as crews have been dispatched and support personnel are securing supplies," OPPD said in a release Monday morning. The power company was reminding people to stay away from downed power lines, and to report any downed lines to OPPD at 1-800-554-6773, or by calling 9-1-1.